These toasting flutes shine with understated elegance. 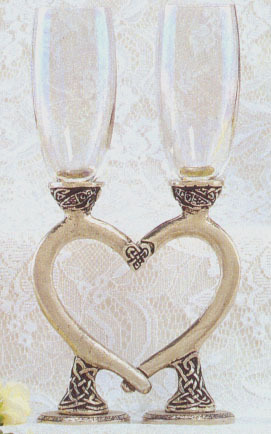 Accents of Celtic knot-work at the base, cradling the glass, and in the center heart that overlaps (when the two glasses are placed together) echo the ornamentation first carved over a thousand years ago. We make them by hand from lead-free pewter and fine glass. Each one holds 8 ounces, and our price is for the pair. * Go to "Cleaning & GLASS REPAIR" near the top of our home-page for our Repair Guarantee! ** Click on the "Color Chart" at the bottom of this page to see the GLASS COLORS.